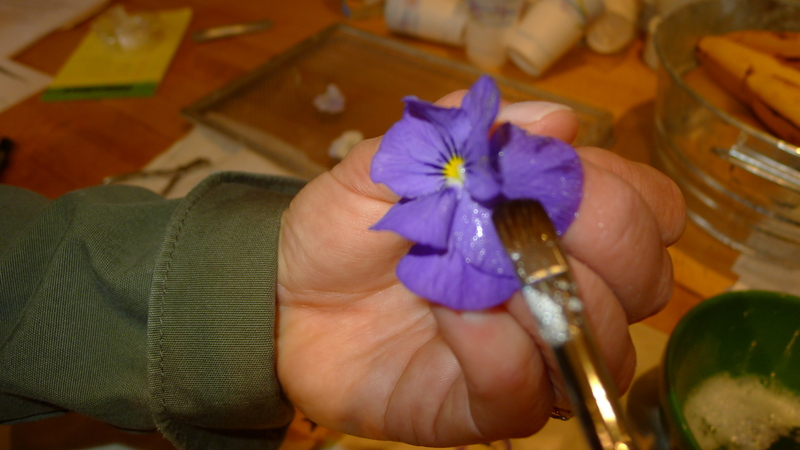 For a garden inspired Valentine’s cake or cupcakes, add fresh or candied viola’s or violets. This winter, I’m making a lot of Middle Eastern foods which call for pickled lemon. 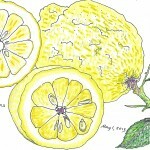 I use the Eureka lemons in my garden, which are a little more sour than Meyer lemons. Like baking bread? Read my recent interview with Davis, CA local Casey Hardi, (pictured in foreground left with Eduardo Rojas.) 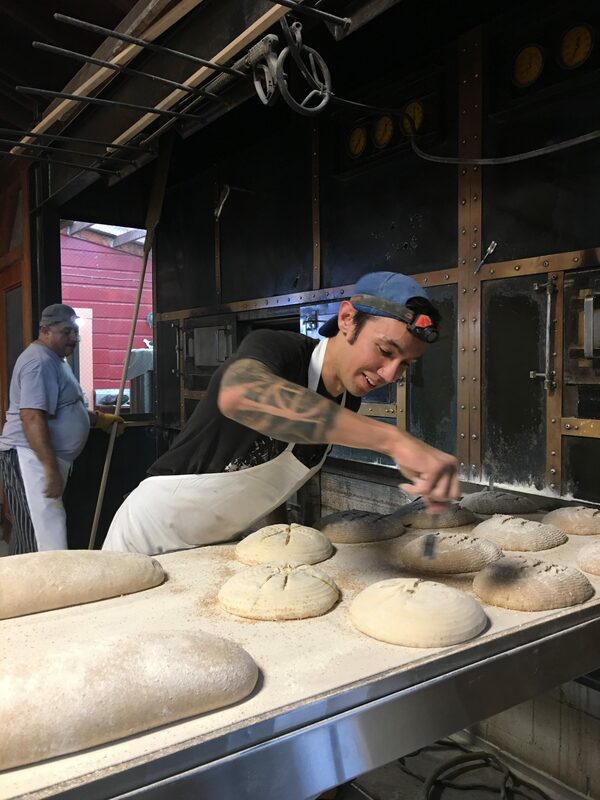 Casey is a Bread Baker for Della Fattoria, the iconic wood-fired oven bakery in Petaluma. 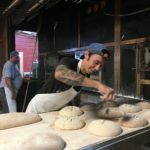 Casey talks about his path to becoming a baker, the differences between bakeries he has worked in, his favorite bakers and bread books, and his advice for young people wanting to enter the profession. Read my December 2019 column on Casey in the Davis Enterprise. Sacramento Bee loved my latest book, Davis Farmers Market Cookbook, Revised Edition (Elderflower Press, 2016, $26.95). Buy now. 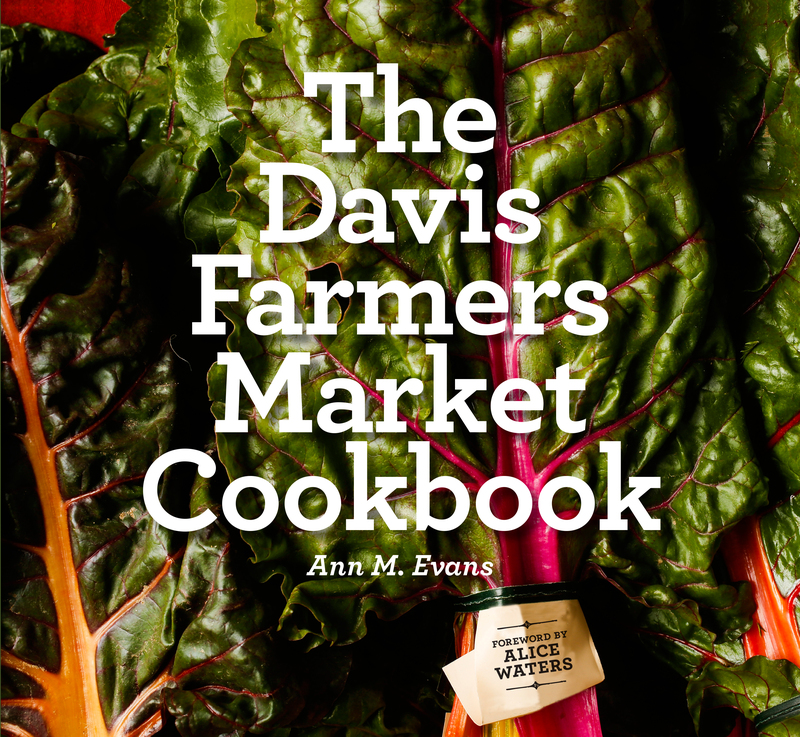 The book is available in Davis, California at the Davis Food Co-op, Davis ACE, Avid Reader, UC Davis Stores, Ikeda’s Market and at the Davis Farmers Market. 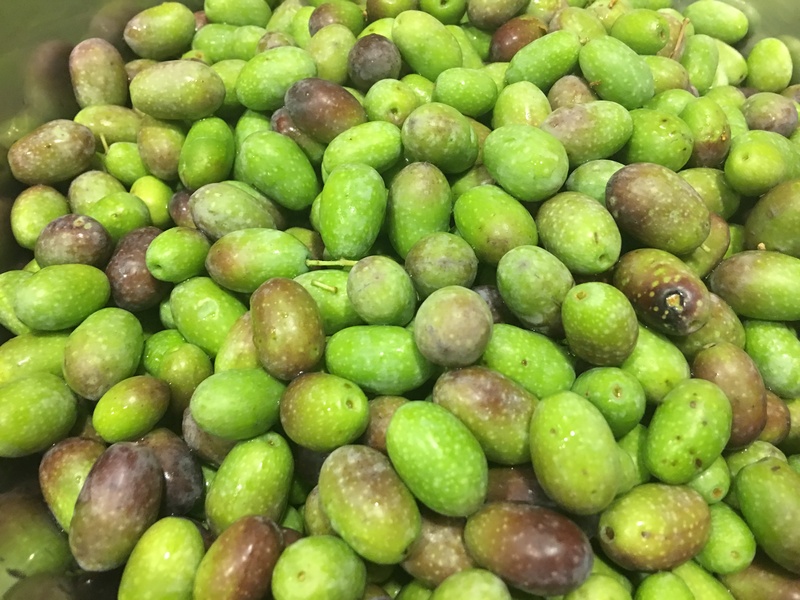 In Yolo County, find it at Seka Hills Olive Mill and Tasting Room in Brooks. In Winters, find it at Preserve Market and Berryessa Gap Winery. Find it on line through UC Davis Bookstores or Amazon. In Sacramento, find it at Avid Reader Books – Sacramento and at Soil Born Farm. The book has 72 seasonal recipes, features the market’s farmers and vendors, and has a year of monthly seasonal menu’s using recipes from the book. Read my story of the history of the market. UC Davis Magazine also featured the students who started the market, including me. Read it.Net proceeds from the book go to the Davis Farm to School Program, a project of the Davis Farmers Market Alliance. Crab Canapés. A canapé is a small piece of bread or pastry with a savory topping, often served at a reception or party. 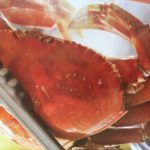 These canapés are especially fun for the winter holidays when Dungeness crab season is in Northern California. Make it vegetarian by using a simple filling of sautéed mushrooms. 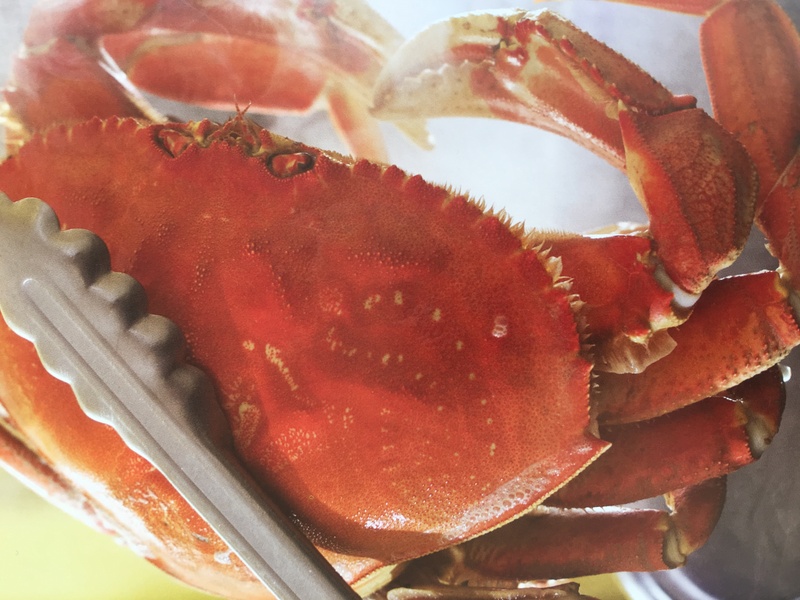 The Davis Farmers Market has fresh crab and a great selection of mushrooms. Limes are in season fall through winter. Olives Seasoned with Orange and Lemon. 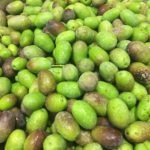 In fall, I harvest my Frantoio olive tree (left) and cure about 12 pounds of olives. But sometimes I want a different flavor or olive. Then, I buy olives at the store and use this recipe, which is fun for a winter holiday party. Fresh oranges and lemons have a particular affinity for green and black olives. With the exception of the olives, all ingredients are available at the Davis Farmers Market. Walnuts Roasted with Rosemary. 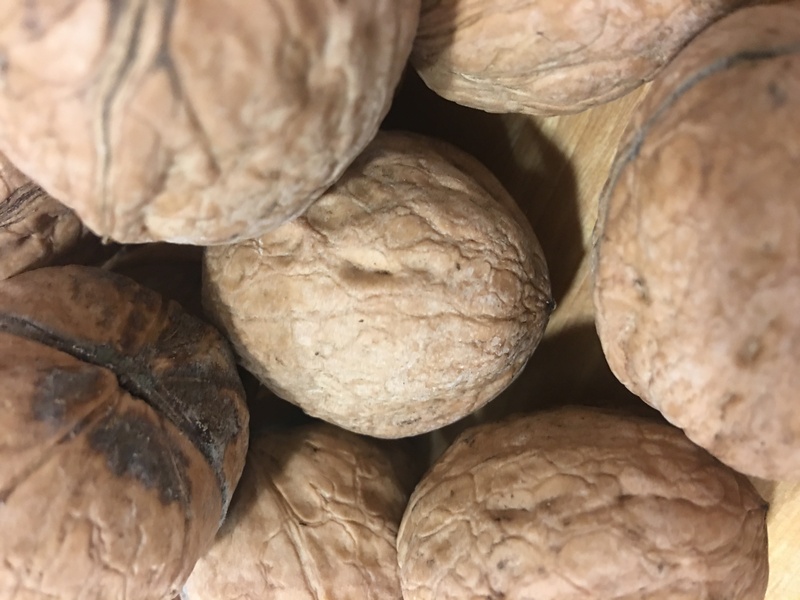 Fall brings the fresh harvest of walnuts here in Northern California, and my home county, Yolo County, has acres and acres of walnut trees. 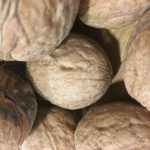 I love to serve this recipe for a winter holiday party using our fresh crop walnuts, which I harvest from a friends orchard or buy at the Davis Farmers Market already shelled. Fresh Rosemary is available at the market; it is easy to grow in a pot or garden. February. I’m making candied viola’s or violets for Valentine’s Day this year, and putting them on top of vanilla cupcakes with vanilla frosting. This is a fun project with kids or friends and they save in your glass pantry for up to six months. The violets grow in between my roses in the backyard and provide late winter/early spring fragrance and color. December. I’m making lemon curd for an English tea I’m serving my 95-year old mother, who was born in Canada, and two friends. Lemon curd is great with British scones, and a perfect way to use some of the Meyer lemons on my tree and in the Davis Farmers Market now. August. I’m making Aioli, the French Garlic Mayonnaise. I pair it with Sockeye salmon, which I caught in Yakutat, Alaska this June. 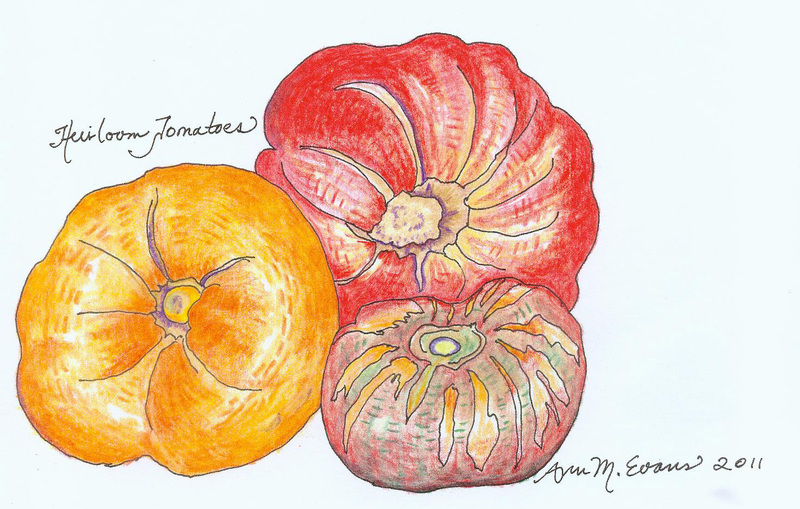 I also serve it with grilled vegetables from the garden or Davis Farmers Market, like my favorite Gypsy red peppers from Lloyd’s Produce, or eggplants. I first started making aioli when I visited Provence in the summer with my daughter and friends. We’d rent a house with a “summer kitchen” (outdoors) — and I’d practice and practice to get it just right. Then I’d make a Grande Aioli meal, with a platter of tomatoes, followed by a platter of grilled vegetables and boiled potatoes, hard boiled eggs, followed by a platter of grilled white fish. Always a gallette of some sort of local fruit from the market for dessert. February. Sweet Potato Pie. Believe it or not, this pie uses oranges, in season right now. This is a great Valentine’s Day dessert, one of my favorites from my youthful, lazy, hot summer days in North Carolina. Sweet Potatoes and oranges are at the market. The recipe is from my Davis Farmers Market Cookbook. If you prefer chocolate, try my V Day fav — Sunken Chocolate Cakes with Ice Cream (from Martha Stewart). November – Thanksgiving Recipes. 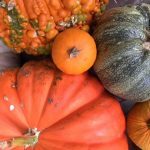 As my gift to you, here is a free, downloadable PDF of all of my recipes from my menu, ThanksgivingToRemember2017, found in Davis Farmers Market Cookbook. 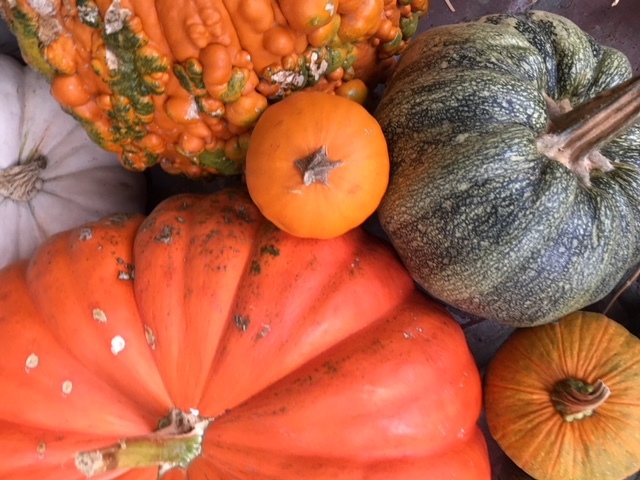 Fall desserts fresh from the farmers market include Old Fashioned Pumpkin Pie made with sugar pumpkins from the market, and, Old Fashioned Custard Pie, made with farm fresh eggs. You’ll love the taste in both of these recipes with fresh ingredients and freshly ground spices. July – Salmon Chowder, Salmon Mousse. 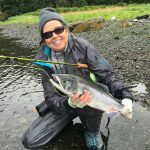 I recently published my Salmon Chowder and Salmon Mousse recipes. I hope you enjoy them. I developed them due to having too much Pink salmon in my freezer after a productive fly fishing trip in Prince William Sound, Alaska. I hope you enjoy them. My Fresh Salmon Cakes with Homemade Tartar Sauce will be published in the Davis Enterprise June 7, 2017. 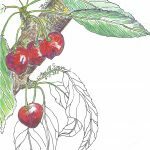 June – Cherry Ginger Chutney. 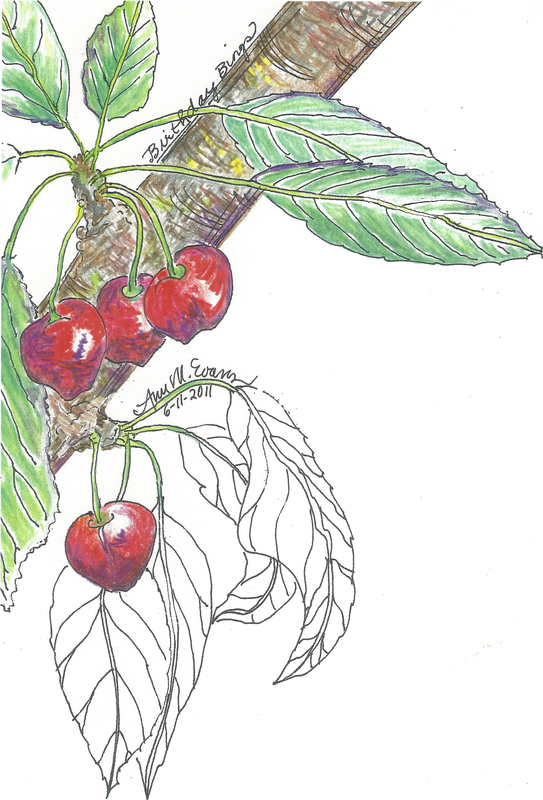 In June it’s cherry season in my garden and at the farmers market. I have several ways I preserve cherries. One of my favorite is cherry ginger chutney. I also can cherries for pie making in the winter, and use an old French recipe to pickle them to serve with charcuterie throughout the year. Of course, I serve them fresh for a simple fruit dessert, sometimes on a plate with dates and soaked walnuts. 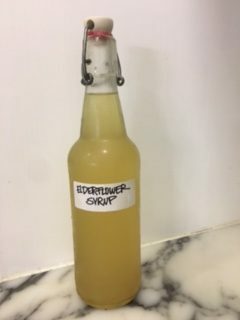 May – Elderflower Syrup. 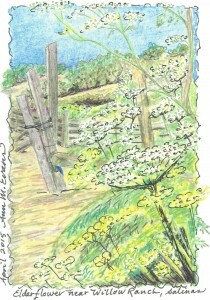 In May the roadsides of rural Yolo County are burgeoning with large green bushes filled with Elderflowers. In the fall, the flowers will turn into elderberries. I harvest the flowers and make an Elderflower Syrup, which I serve all summer in sparkling water and wine. The Elderflower grows throughout California, and is found across the country and around Europe on backroads. Read the recipe. April. Edible Flowers. 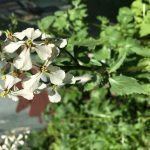 Like those of Arugula at left, edible flowers are an important part of my year round kitchen garden. Right now, April, I’m harvesting bright orange calendula petals for green salads with fava bean leaves, cream colored, spicy arugula flowers for decorating grain salads such as with farro, bright blue rosemary flowers to go with grilled chicken or beef, and violets, which I like to candy and put on top of cupcakes for the children in my life, little and big. 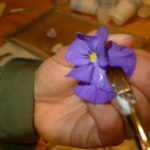 Read more about edible flowers you can plant. 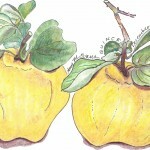 Preserved Lemons – Meyer (thin skinned). It’s March, and my Meyer lemon tree is loaded with fruit. So I recently made preserved lemons with Meyers, which are sweeter and thinner skinned than the classic, sour Eureka or Lisbon lemons. I serve this with roast chicken or any Middle Eastern dish. I also have a recipe on my website for preserved lemons with the Eureka lemon. Marmalade. 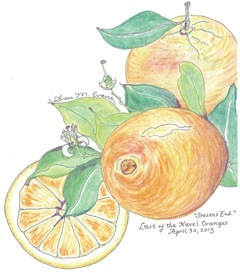 It’s February, which means my Naval oranges and Eureka lemons are ripe. This year I’m making marmalade with Allie Lesser who’s teaching me how to cook Lebanese food. The recipe uses no pectin, so while it’s easy, don’t multiply up, and do watch for the gelling point. I give some tips in the recipe, but practice makes perfect. Too liquid — syrup for a sponge cake; too hard — chunky topping for ice cream. Lemon Curd. 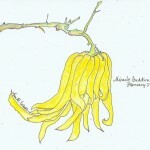 With an abundance of lemons on both my Meyer and my Eureka Lemon trees, I’m making lemon curd this January. I use it warm on toast for breakfast, serve it for a late afternoon tea on an English muffin or a crumpet, and, in a small tart for a dinner dessert on the weekends or for company. Sometimes I eat it by the spoonful from the jar. This puts me in the mood for a proper tea party. Cranberry Shrub with Buddha Hand Citron and Ginger. I’m serving this Christmas evening before dinner, with sparkling water or wine. Make the fruit syrup several days ahead of time, it will store for several months in the refrigerator. 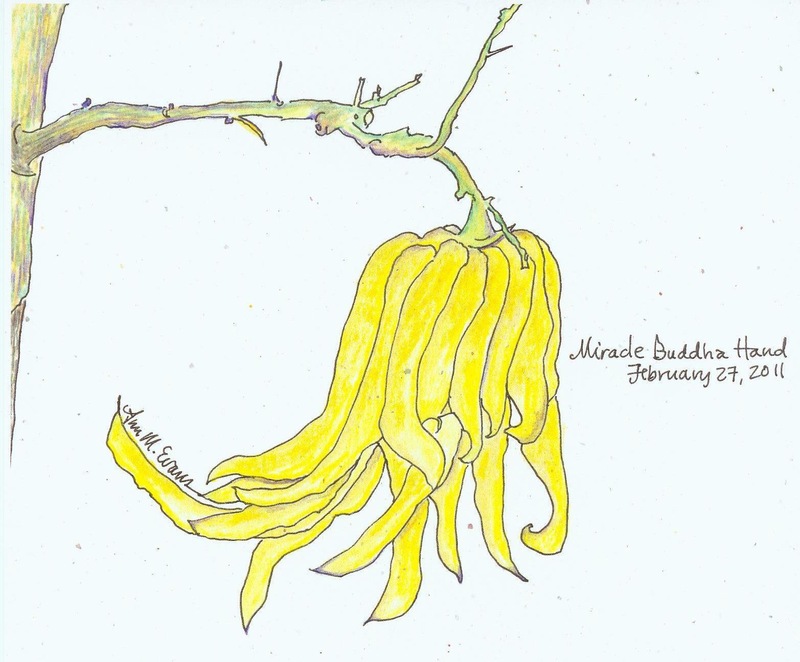 My Buddha Hand Citron tree grew two fruit this year, which is how I happened upon putting them in the shrub. You can substitute lemon peel if needed. Olde English Piccalilli is a favorite condiment recipe I make at the end of summer with green tomatoes from my garden. My English husband loves it with any cold meats, chicken, ham, roast beef. It will transport you to an English pub and bucolic countryside, I promise. I include it in my new Davis Farmers Market Cookbook. 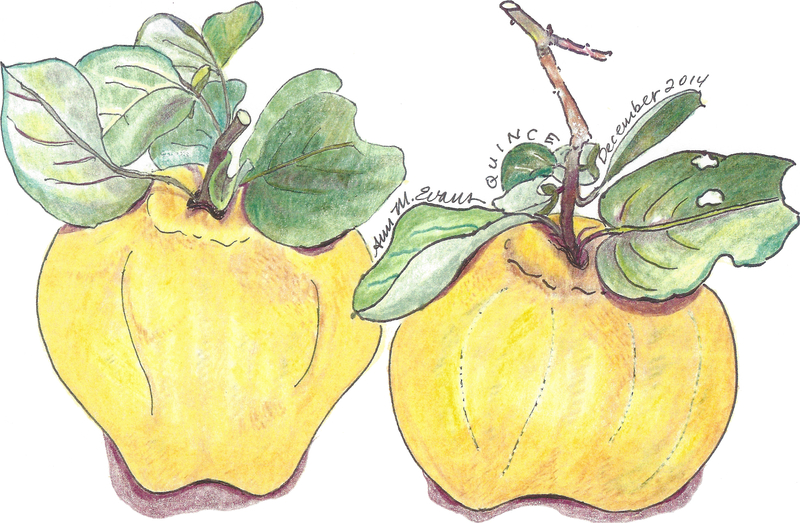 Quince Chutney is a favorite fall product to can. I pick them from a French friend’s tree, usually early November, and trade him some of my bee’s honey for his quince. Though I’ve made it for years and changed it a bit, the recipe is from Annie Main, in 2004, when we had a business together making confitures, Evans & Main. She still makes it and offers it for sale at the Davis Farmers Market. It’s delicious. 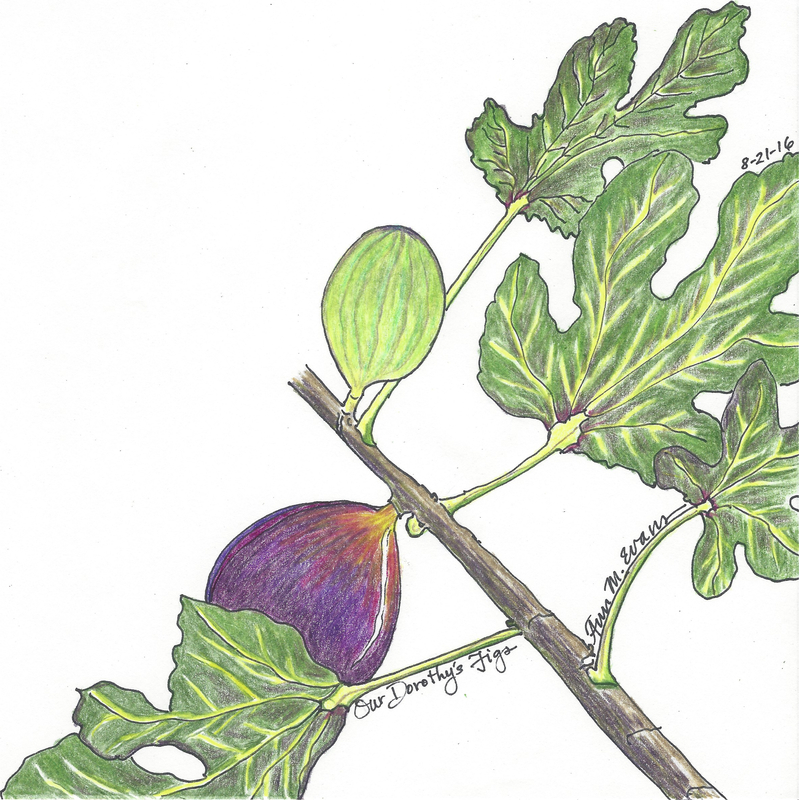 Fig Jam is a staple in my glass pantry and I make it every September. I serve it with a cheese course in the fall with fresh walnuts and some of my bees’ honeycomb. I don’t have a fig tree, but my friends who do are very generous and provide me with enough for several batches of jam. Homemade Ketchup is a favorite pastime of mine in August. I devote a day to it and then enjoy it the rest of the year. This year, I’ve made a date with my niece Rayne to make it together. I enjoy the time in the kitchen with her, and then she has something special for holiday gifts and her family’s table. Call me American, but I especially enjoy this ketchup on scrambled eggs made fresh from my chickens. Mint Infused Simple Syrup with Fresh Lemonade is what I make in June and July when my lemons are dropping off the tree and I’m madly pulling out the mint which spreading throughout my garden. I serve it French style, inspired by sipping Citron Presse in Provence many a summer on the village square. The mint syrup lasts for up to three months in refrigerator and is good in sparkling wine or water as well. Elderflower Cordial is what I make in April or May, from flowers I gather on the roadside in Yolo County. It’s a lovely and easy way to preserve the season, and no one can quite believe the taste — a hint of herbal, of lemon, or wild, of vanilla, or lemon verbena. Great in sparkling water or wine with ice. 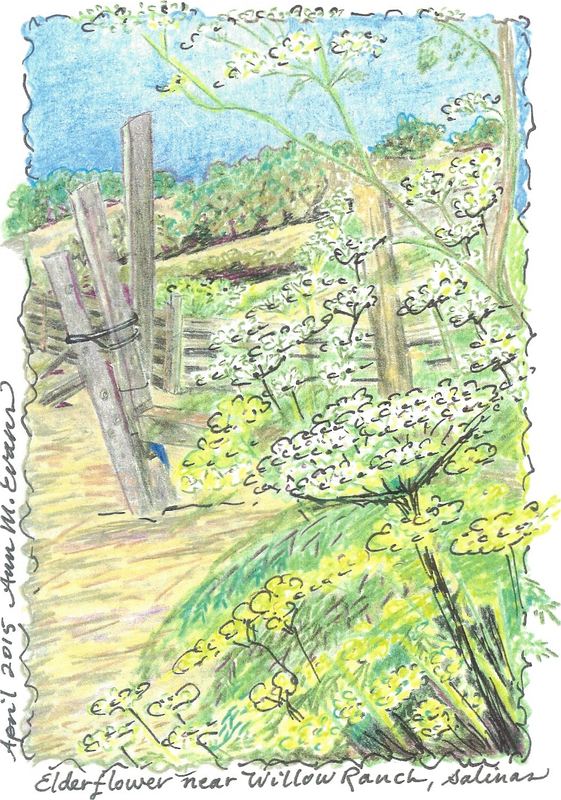 The drawing to the left is of elderflower I drew in Monterey County. 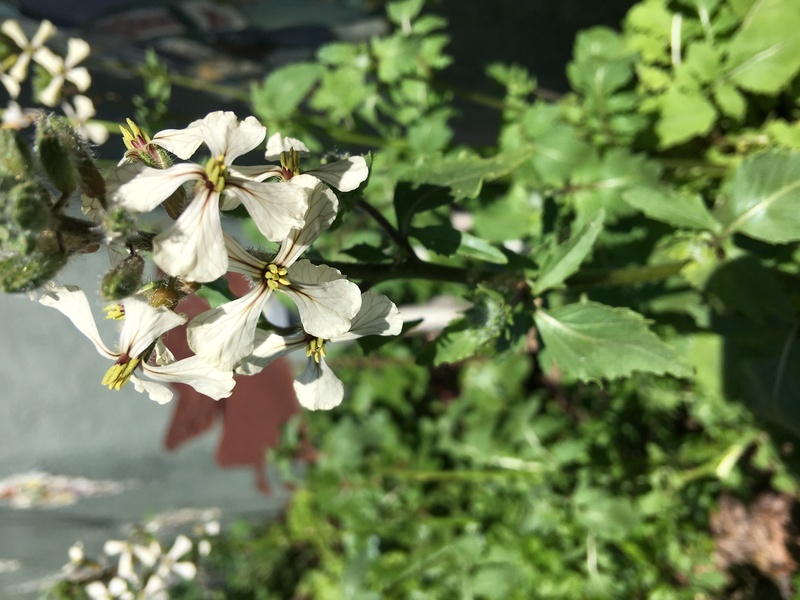 It grows along the roadside throughout California’s back country roads. 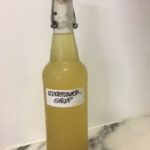 Elderflower is a popular drink throughout England and France, and many there, like I do, make their own simply syrup elderflower cordial. Cherry Ginger Chutney is great to make in April-May-June, cherry season. It is perfect with a cheese course, with Indian curry, or with duck breast and any kind of pork roast or chop. Candied Kumquats are a sweet and tart sauce to add over almond pound cake or ice cream. You can make this now, in March-April, while kumquats are still ripe on the tree, and freeze it for later use. Marmalade with Three Kinds of Citrus is one of my specialities. I make it with my navel oranges, lemons and a neighbor’s grapefruits in February, and then store it in my glass pantry throughout the year, occasionally using it as a hostess gift. My English husband and brother-in-law love it. This is a real marmalade lovers’ marmalade, a little bitter with lots of peel. Preserved Lemons is a favorite winter recipe. 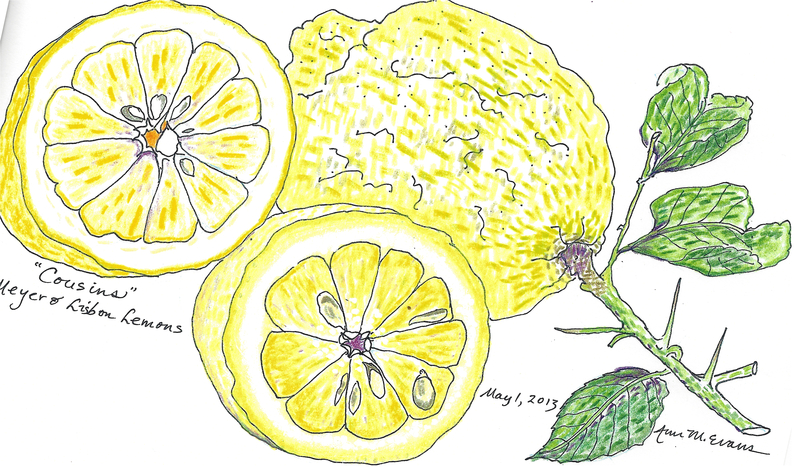 To the right is my drawing of the Eureka lemons in my garden. The lemons are ripe now, any varietal will work. Use them with roast chicken and various Middle Eastern dishes. You can also find this under Recipes on my website. There you’ll also find recipes for preserving by the season, and making festive dishes. But the recipe sounds delicious and I’d like to make it, so please, how much flour? Thanks. I do hope I replied earlier, I thought I had. Just in case, you’re right, the flour was left out. Perfect time to make that recipe now with dates back in season and at the Davis Farmers Market. 2 and 1/4 cups general purpose flour. Happy cooking. Guide your way on” and the most lovely warm feeling of you welled up in me. I so remember sining that song with you and all the warm wonderful times we had together on 5th street and your visit to me when i turned 30 in san francisco. I hadn’t heard from you in awhile so i thought i’d try to find you on the internet. I put your name in and this blog came up #1. I hope this is still active. You’re pictures are terrific and your blog is so you — the salt of the earth, genuine open. I send you my love as does Jud (he’s Jud now). Let’s do be in touch. I apologize for the delay, I don’t often check these comments. I have your email now and will communicate, but I wanted to let you know I sing that song frequently, sometimes as a healing for those facing illness and death, and I love it. Thank you for all your teaching of me, and others. I remember our wooden bowls, chopsticks, the buying club, and our gallon jars of beans all in a row. Hello to brother Jud. 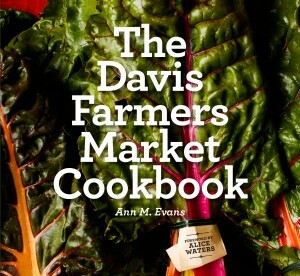 Glad you like the website, and check out, if you want to, my new book — Davis Farmers Market Cookbook, Revised Edition. That’s a lot of what I’ve been up to. And thanks for your kind words. First, congratulations on your new edition! I want to buy it but haven’t found it online. Second, I’m publishing a campus novel, Oink: A Food for Thought Mystery, which is set in “Arborville,” a place very like Davis. The town is a character in its own right, most often representing the ways in which Davis/Arborville encourages community. There are scenes in the Farmer’s Market, on the greenbelt, in Village Homes, in Wild Horse, in North Davis, and of course many on campus. A sly send up of the corporatization of the university, Oink is also a reminder that community lies at the heart of human life and one of the things that sustains community in the novel is food. The book comes with 18 recipes for dishes made of corn. I’m writing to ask if you’d be interested in blurbing the book and/or teaming up for some readings or events centered on food. I’ve found it a lot more fun and more effective to team up for book promotions. I’m definitely interested in doing something on March 5, Pig Day at the Farmer’s Market, for example, and in doing panels about food and food writing that might give part of the profits to food banks. 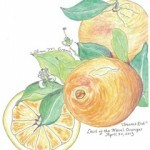 I know your book just came out and that you are promoting it now, but there are tons of festivals involving food ahead. We could think about UC Davis too since there are a lot of people doing food studies there. If you’re interested, we could have a phone call. Here are some of the things people are saying about Oink. According to Janet A. Flammang, author of Table Talk: Building Democracy One Meal at a Time, “food themes abound in this engaging and well-crafted mystery which combines concerns about genetic engineering and pesticides with reflections upon the satisfactions of building community through sharing food and food stories. 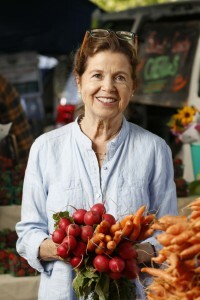 Recipes are included.” Janet is a professor of emerita in political science at Santa Clara. I love her work, especially A Taste for Civilization. Pam Ronald, co-author of Tomorrow’s Table: Organic Farming, Genetics, and The Future of Food found it “entertaining,” “a good read that is both humorous and thoughtful.” Pam is in Plant Pathology and Genetics at Davis. Maggie Berg and Barbara K. Seeber, authors of The Slow Professor: Challenging the Culture of Speed in the Academy say this: . . a witty combination of a campus novel, a murder mystery, a debate about GMOs, and a recipe book, . . . Oink is a celebration of community connected to the joy of food and fellowship. At a time when collegiality is on the decline because of the corporatisation of higher education, Newton’s light-hearted novel makes the serious point that collegiality is important not only personally but also politically. It has been said that the comic campus novel is no more (things in higher ed are verging on the tragic), but Oink proves otherwise. Here’s a summary: Emily Addams is the last person you’d expect the police to be circling in a poisoning investigation. A professor of women’s studies, a food writer, and a doting mom, Emily has spent her life building a campus community and engaging in peaceful struggles against injustice. But when Peter Elliott, a professor of plant biology at bucolic Arbor State is found comatose in a pig pen clutching a piece of Emily’s corn bread (unmistakable for its goat cheese and caramelized onions) it’s in her direction that the police turn. Even as she comes under suspicion, Emily and her comrades in women’s and ethnic studies are fighting the administration’s attempt to defund their programs and run their beloved Arbor State more like a corporation than a place of higher learning. Her efforts to save her own skin and to protect the campus community she loves come together as Emily and her colleagues launch their own investigation to find out who really slipped the professor a piece of cornbread spiked with pesticide. It is community, fueled by good food, that helps them solve the crime. Here’s more about me: I’m at work on another mystery in the Food For Thought Series. Aside from my five academic books, my food memoir, Tasting Home: Coming of Age in the Kitchen, was published with She Writes Press in 2013, received a starred review in Publisher’s Weekly Select, and won twelve independent press awards. 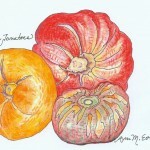 You can read more about my work at judithnewton.com and https://www.facebook.com/TastingHomeComingOfAgeInTheKitchen/. Okay, that’s a lot. Let me know if you are interested in blurbing or teaming up. I’ll understand if you say no. But I’d still love to send you a copy of the manuscript. It’s so Davis! We’ll communicate via email, but wanted to let you know I got the book, and I can’t put it down. Nice job. Gosh Barbara, almost a year since you wrote. Happy New Year. Thanks for your kind words. Good luck with the garden.